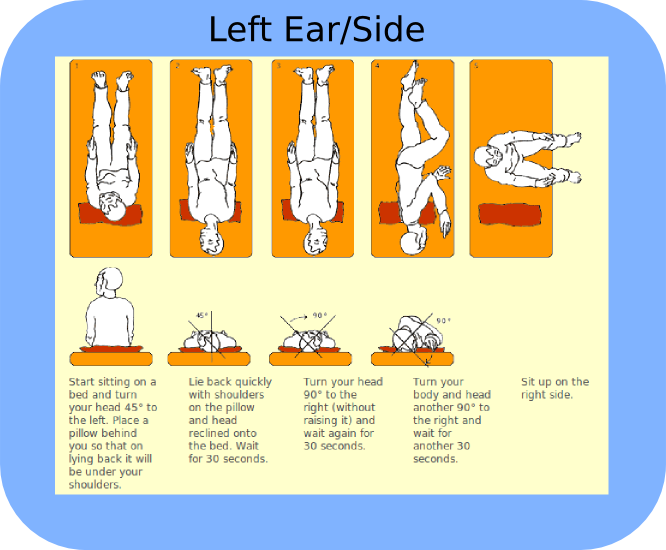 The Epley Maneuver demonstrated, is the way to reposition loose crystals in the ear, also known as Benign Paroxysmal Positioning Vertigo, so that the symptoms caused by the loose crystals go away. 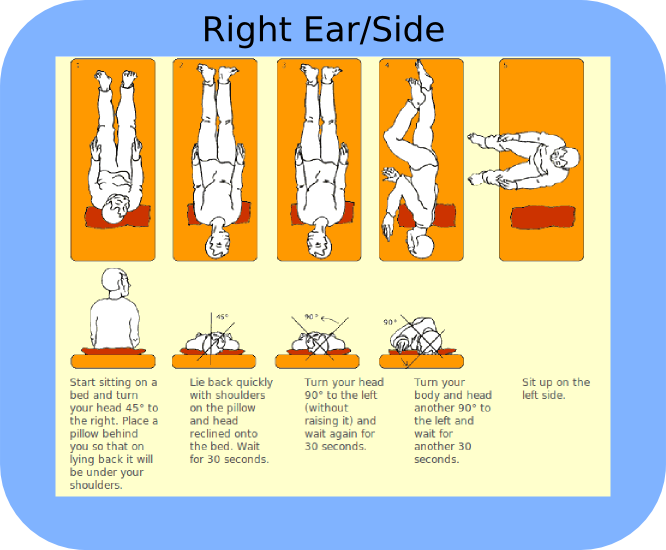 Benign Paroxysmal Positioning Vertigo is caused by loose inner ear crystals in the inner ear that migrate while sleeping to the back-bottom inner ear balance canal, the so-called “posterior semi-circular canal.” The maneuver demonstrated below is the way to reposition the loose crystals so that the symptoms caused by the loose crystals go away. You may have a floating, swaying sense while walking or sitting for a few days after this procedure. Benign Paroxysmal Positioning Vertigo is one of many balance disorders that we diagnose and treat at the Tampa Bay Hearing & Balance Center. Contact us today to request an appointment. Restrictions apply for the first 24 hours after the treatment. When reclining for sleep, sleep as near upright as possible. Ideally, the head should not tip backwards more than 30 degrees which means that the back cannot be tilted backwards more than 30 degrees. There is no limit to how many times the CRP can be re-done. If the CRP does not seem to clear the problem, please allow us to evaluate you again. Rarely, a more serious problem may initially look like Benign Paroxysmal Positioning Vertigo (BPPV). As well, some patients simply have too much debris in the posterior semi-circular canal to clear without surgery. Surgery can also relieve BPPV, but surgery is only rarely necessary.